The cover for issue #12. 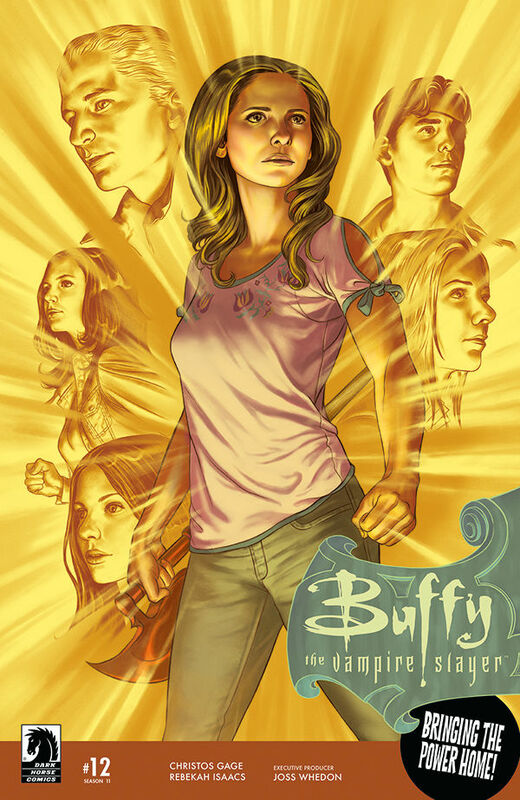 Dark Horse’s Season Ten of Buffy the Vampire Slayer was fantastic from start to finish, and I’m still amazed to think about how the writers managed to pull it off. But when the season ended, I remember feeling skeptical about whether Dark Horse would be able to keep the quality of Buffy high going forward. Unfortunately, that skepticism was soon revealed to be warranted. Season Eleven turned out to be hands down the worst season of Buffy that Dark Horse has ever delivered. I think I hated every issue except the first and last. So what exactly went wrong? Let’s count the ways. The biggest mistake was a lack of internal logic in the stories. A common error that writers make when it comes to writing fantasy is a belief that because it’s fantasy they don’t have to worry about whether anything makes sense. But a fantasy world needs to be built on a foundation that’s believable, even though many aspects of the world won’t be. If the foundation of the fantasy world doesn’t make sense, the stories that come out of it will fail. Dark Horse started to make this mistake in 8.21 Harmonic Convergence when it had society accept vampires but reject Slayers. This served the story arc at the time, as the writers wanted the Slayer army to be completely alone and isolated. But the sacrifice of logic for short-term gain created a convoluted world in which vampires (serial-killers with superhuman strength) are accepted simply because they promise not to kill people anymore. This was nothing less than absurd. So at this point we were given a fantasy world whose foundation lacks any sense. This didn’t affect the stories much until now because it was underplayed, but now that it’s at the forefront of the story arc it becomes a fatal flaw. So the seeds for the disaster of Season 11 were actually planted in Season 8 when the writers decided to make society fully aware of the presence of the supernatural. But this all actually started back during the television series when Buffy and Angel introduced the idea of benevolent demons. Originally, all demons were evil and could be justifiable killed without hesitation, but this new twist really muddied the waters, and not in a good way. ​ A lack of logic is also part of the next mistake Dark Horse made with Season Eleven: Making simplified arguments over complex political issues. In issue #2, it is revealed that Congress proposes a law making it illegal to use superpowers without authorization. This is in response to the dragon attack on San Francisco. The Scoobies are horrified by this, but it actually makes sense. It’s been clearly established that there are people/demons who used their powers to harm others, so why wouldn’t you want to regulate that? Likewise, the attacks on the Wicas in their apartment complex (who are rescued by Willow) are suggested to be done out of pure bigotry, but we would all be justifiably terrified out of our minds if certain people among us had superhuman strength or the ability to cast magic. It’s not bigotry that prompted the attacks but legitimate fear. Now, it’s not all that surprising that the Scoobies would have such knee-jerk reactions given their unique perspective of the world. The problem is that the comic implies their views are correct. 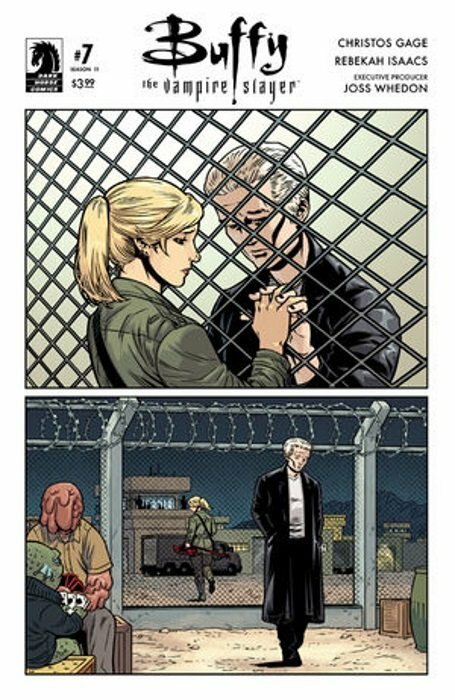 A good example occurs at the end of issue #2 when Buffy and Spike are aghast at the announcement of “internment camps”. This is lazy writing, as the writers assume that all they have to do is throw out the phrase “internment camps”, and it will be obvious to everyone that internment camps for supernatural beings would be morally wrong. But this isn’t obvious at all. Why wouldn’t you want to lock up all the vampires? Actually, why wouldn’t you simply just kill all the vampires? Likewise, in issue #3, Xander and Dawn look on in horror as a demon is arrested and sent off to a camp. His girlfriend whines about this being similar to people who were arrested for interracial marriage. But demons aren’t human beings, so they technically wouldn’t have any constitutional rights. And it would be foolish to think that a demon is just like a human being, especially given all the evil demons we’ve seen over the years. A 'deleted scene' which is actually the alternate cover for issue #7. There seems to be an attempt to draw parallels between this and our civil liberty debates in regards to terrorism, but the parallels simply aren’t there. How our government would handle the presence of the supernatural would be an extremely complex political issue without simple solutions, but unfortunately the entertainment industry is dominated by liberal writers who are usually incapable of seeing any legitimacy to opposing political arguments which makes them incapable of addressing these debates in a proper, balanced way. They see their own viewpoints as being obvious, so why wouldn’t everyone else? Furthermore, even if the writers were capable of addressing these political arguments properly, the issues are so complex that it’s hard to see how it could make for an entertaining action-adventure comic. It would have been better to keep society generally unaware of the existence of demons and vampires. Even though this itself might lack believability, it would be worth it to avoid a story arc like this one. The next big mistake was that the season was plot-driven instead of character-driven. The Buffy television series provides a perfect example as to why this makes a difference. The first season of Buffy was based on monster-of-the-week stories. In other words, it was plot-driven. But the writers soon realized that the viewers cared more about the relationships between the characters than they did about the monster plots, so the second season and third seasons focused on the Buffy/Angel relationship and to a lesser extent Xander/Willow/Cordelia, Giles/Calendar, and Willow/Oz. A new Slayer, Faith, was introduced in Season Three, and the arc also involved her turn to evil. This change in focus from plot-driven to character-driven stories is what caused the second and third seasons to soar. Season Four was the most disappointing of all the televised seasons, and this was due mostly to the return to a plot-driven story arc involving a military base (The Initiative) located directly underneath Buffy’s college that lacked believability because it was so absurd on its face. Xander and Giles had literally nothing to do for much of the time, and ironically the most entertaining subplot of the season involved Spike who was turned into a humorous character. So a character-driven story arc proved to be the only salvation of the entire season. A 'deleted scene' which is the alternate cover for issue #5. Season Five returned the series to form, with the season story arc built around the arrival of Buffy’s sister Dawn, and Spike falling in love with Buffy. Season Six centered around Buffy having to deal with the fallout from having been pulled from heaven, her romance with Spike, and Willow’s turn to darkness. Season Seven centered around Spike being put through the wringer (having regained his soul) as well as his relationship with Buffy. All character-driven arcs. To sum it up, if you want the stories to soar, then the characters should drive the stories. Instead, for Season Eleven the writers simply inserted the characters into the story that they wanted to tell. That’s a big reason why the season came up short. Here’s one example of plot winning out over character. At one point, Buffy and Willow lose their powers. This should be a big deal (even though it’s happened before), and yet little of consequence happens. In fact, it isn’t long before they both get their powers back. So the whole thing is just treated as a way to advance the main story forward. But imagine if the comic had taken the time to really explore what it would be like for Buffy and Willow to live without their powers. How would it affect them? What would it mean for the rest of the Scoobies? It was a real wasted opportunity. In another example, Buffy allows Spike to feed on her numerous times while they are staying at the camp. But shouldn’t this have affected her feelings for him negatively in some way? This would have been an interesting avenue to explore, yet Buffy isn’t bothered by this at all. Again, characters are simply used in service of plot. In fact, the whole Buffy/Spike relationship which has been so fascinating fails to become so during Season Eleven. The relationship remains completely static the entire time (as does Xander/Dawn), and so it’s another missed opportunity. In addition to a fantasy world with a flawed foundation, there were plenty of gaps in logic in the plot that stood out. In issue #2, Willow is offered to become a federal agent. But when she learns that she can’t be autonomous, she gets angry and acts like the whole thing is some kind of trap. But it makes sense that there would be national security issues involved with the job that wouldn’t allow her to remain autonomous as she would have preferred. Her anger is completely misplaced. If she had accepted the position, she could have prevented Spike from being sent to the camp. Also, the scenario in which Buffy and Willow regain their powers is a little too convenient. Willow makes it to the room that has the machine that can reverse the process and, amazingly, she knows how to operate it. Even more amazingly, there is no password or identification required to access the machine! Really? I know that government can really be inept, but I just don’t buy this lack of security at all. At the end, Willow uses her magic to strip every single Slayer on Earth of their power and gives it all to Buffy. And yet Buffy is actually less powerful than she was when she simply absorbed the power of the Slayers in her army after they died back in Season 8. If you recall, she had the power to fly, she was faster than a speeding bullet, she was invincible… If Buffy now had the power of every Slayer on Earth, shouldn’t she be even more powerful than she was then? How could half of her face get burned off? It’s an example of the writers ignoring history and making things up as they go along, which is the worst kind of writing. Also, it seems like Willow is too easily able to take away the Slayers’ power as well as give it back. Shouldn’t there at least be a complicated spell involved? It just feels rushed, like the writers can’t be bothered with such an inconvenience. Another problem with the season was the disappointing reveal of the Big Bad at the end. The Big Bad of Season Eleven turns out to be the Press Secretary. The Press Secretary??? Seriously? That’s the best that the writers could come up with? This has to rank as one of the worst pay-offs ever. It almost feels like an early April Fool’s joke. Finally, there was the lack of a satisfying ending. The final battle in issue #12 was decent but the aftermath was a disappointment, particularly Buffy’s decision to give all the power back to the Slayers. Buffy says she doesn’t have the right to keep the power. But the bad Slayers do? If anyone could be trusted to handle that kind of power responsibly, it would be Buffy. She would be far less likely to misuse it than many of the Slayers we’ve seen over the past few seasons, and it could have opened up a fascinating story arc for Season Twelve. But the writers took the lazy way out again here, delivering a simple, cookie-cutter resolution. The happy ending on the rooftop that closes the season out also falls flat, as we usually are given a hint of what is to come next season. But no such thing happens this time around. 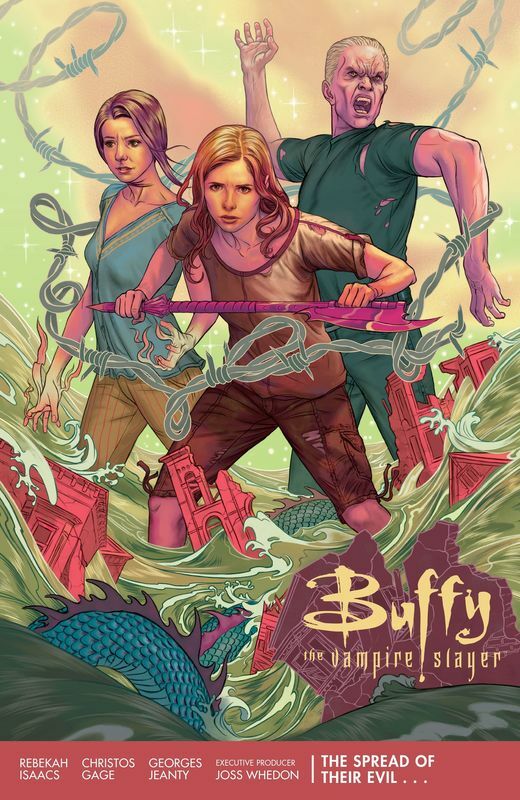 So what are the prospects for the future of the Buffy comic? As of this writing, Dark Horse hasn’t even announced Season Twelve yet which is very odd and not a particularly encouraging sign. The fact that there were only 12 issues for Season Eleven were likely due to the fact that the sales of the comic have really fallen over the years. Now, I can actually understand why Season Eleven was more plot-driven than character-driven as the latter is simply not easy to do. After all, how much more can the characters change after ten seasons? Where can Buffy/Spike and Xander/Dawn go from here? There are no easy answers. However, if the current writers aren’t capable of rising to the challenge, then Dark Horse needs to bring in writers who are. One thing that would likely help Buffy (and Angel) would be to plan an ending for the series, and build up to it in ways that the readers can see coming. This would give the comic a clear direction which it currently seems to lack. 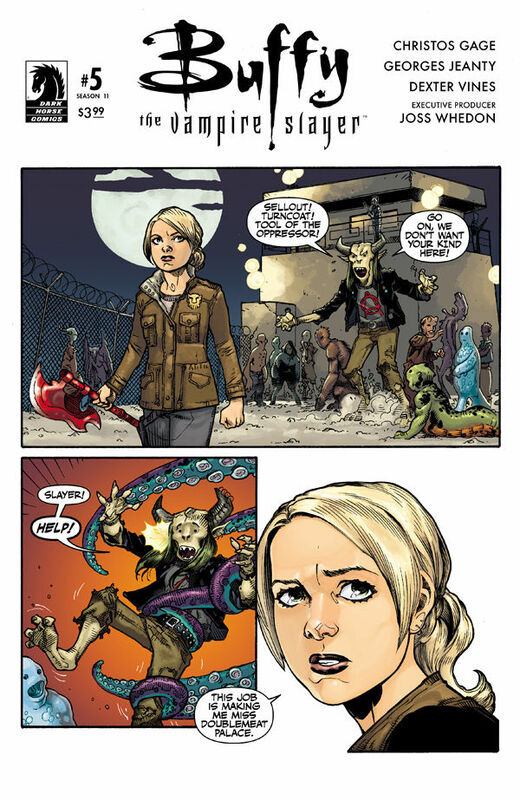 Ironically the ending of Buffy was already hinted at a long time ago in the Fray miniseries (issue #4) back in 2001. 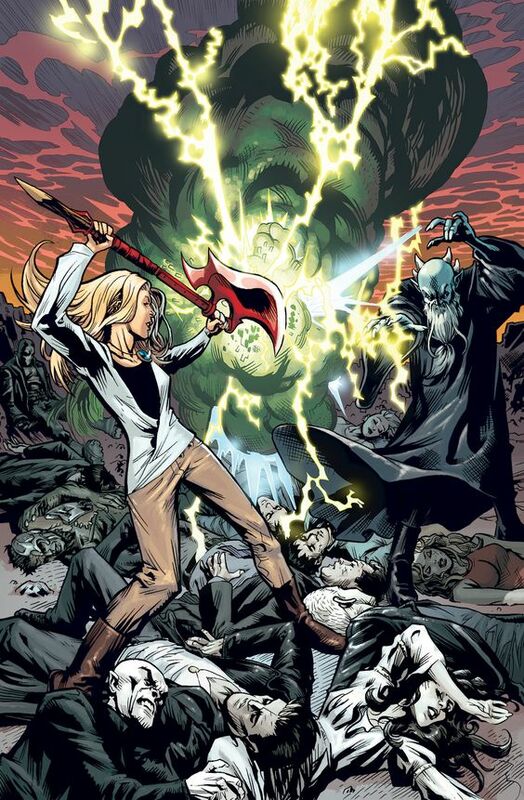 We are told that in the 21st century the last Slayer banished all demons and magic from our dimension and she (presumably Buffy) appeared to have disappeared along with them. Who knows if Dark Horse will choose to adhere to this or ret-con it (i.e. ignore it), but planning a well-thought out ending for Buffy (even if it’s several seasons away) could be the key to getting it back on track. Also, making Fray relevant again could be really exciting. Season Eight’s Time of Your Life arc was the best story arc of that season, and the Dark Willow thread that was left dangling could be picked up on. Was the Dark Willow of the future our Willow or a Willow from an alternate universe? If the former, how does this happen? These are questions just begging for answers.